SubpaQ | Water Pumps | Headhunter Inc. Unlike conventional water pumps, the SubpaQ installs inside the freshwater tank, saving precious space in the machinery room, and eliminating priming difficulties. This variable speed, constant pressure pump provides flow rates that outperform conventional pumps with similar power consumption. Let sleeping crews lie! The SubpaQ’s innovative motor technology and submerged location result in incredibly silent operation. 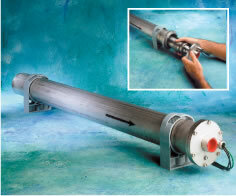 Run silent …run deep is the mission for the SubpaQ Water Pressure System from Headhunter. Unlike conventional water pumps, the SubpaQ installs inside the freshwater tank, saving precious space in the machinery room, and eliminating priming difficulties. This variable speed, constant-pressure pump provides flow rates that out-perform conventional pumps with similar power consumption. Let sleeping crews lie! The SubpaQ’s innovative motor technology and submerged location result in incredibly silent operation. Manufactured with 300 series stainless steel and tungsten carbide bearings, the SubpaQ is tough enough for the most demanding applications. Reliability is further enhanced with built-in functionality for protection against running dry and over-or under-voltage. The SubpaQ Water Pressure system is an ideal solution for the high flow and pressure demands of today’s luxury yachts, and commercial/military vessels. Pump settings and historical pump operating data can be accessed from the control panel with the hand held remote. Data and pump settings can be printed out to an optional HP printer available from Headhunter. 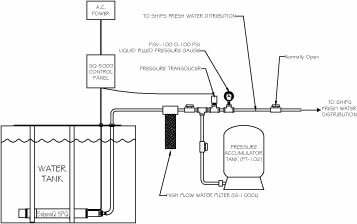 All in-tank SubpaQ systems include pump with stainless mounting bracket and flow sleeve, stainless pressure transducer and SQ-5000 control panel. Consult Headhunter for custom hatch and mounting bracket fabrication. All external SubpaQ systems include pump installed in stainless pipe sleeve, SQ-5000 control panel, and stainless pressure transducer.